Last evening I arrived at Shari Town after riding motorcycle for 17 hours for 464 km from Otaru. I was completely exhausted and fell in asleep at night in my tent. 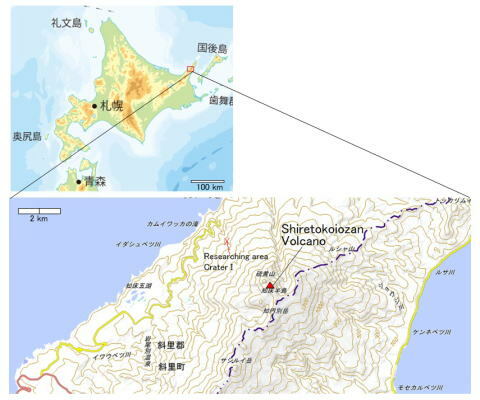 Shiretokoiozan Volcano is located in the middle part of the Shiretoko Peninsula and it is around 25 km from Utoro Town where hotels and shops are located. Where I am staying is much far from Utoro Town and I would take one hour and a half to get the beginning of mountain trail. But Shari Town is much convenient to stay. My researching area is around Crater I which expelled the molten sulfur which is located at approximately 600 meters from the sea level. It is necessary to walk on the mountain trail for 1.5 km to get there. This area is completely covered by snow in the winter and accessible between June to September. When I am staying in the mountain, I sometimes see bears, foxes and deer. I am looking forward to seeing those animals.